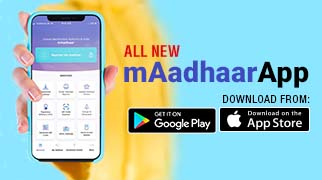 UIDAI Website does not automatically capture any specific personal information from you, (like name, phone number or e-mail address), that allows us to identify you individually. This website records your visit and logs the following information for statistical purposes, such as Internet protocol (IP) addresses, domain name, server's address; name of the top-level domain from which you access the Internet (for example, .gov, .com, .in, etc. ), browser type, operating system, the date and time of the visit, the pages you have accessed, the documents downloaded and the previous Internet address from which you linked directly to the site. We make no attempt to link these addresses with the identity of individuals visiting our site unless an attempt to damage the site has been detected. We will not identify users or their browsing activities, except when a law enforcement agency may exercise a warrant to inspect the service provider's logs. If the UIDAI Website requests you to provide personal information, you will be informed for the particular purposes for which the information is gathered and adequate security measures will be taken to protect your personal information. UIDAI does not sell or share any personally identifiable information volunteered on the UIDAI Website to any third party (public/private). Any information provided to this website will be protected from loss, misuse, unauthorized access or disclosure, alteration, or destruction.